Jimmy Dean’s quotes have continued to be inspirational to many people around the world. He was a famous country music artiste and television host who overcame poverty, including dropping out of High School, to achieve success. He was also best known for his Jimmy Dean sausage brand. He also appeared in the James Bond movie, Diamonds are Forever. Following his death in 2010, he was inducted into the Country Music Hall of Fame posthumously. "I can not change the direction of the wind, but I can adjust my sails to always reach my destination." He used his life experience as a reference point to motivate people, saying that poverty shouldn’t be an obstacle, but a motivating factor to succeed in life. 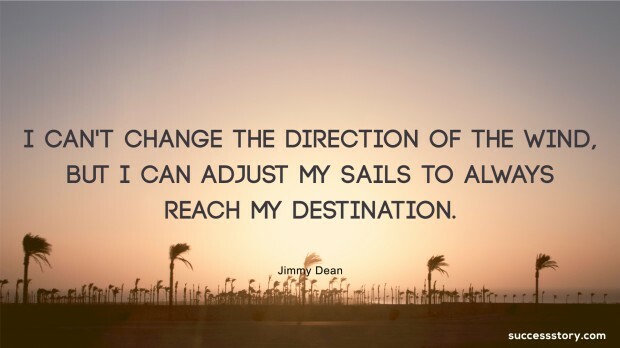 One of Jimmy Dean’s most famous motivational quotes was about overcoming life’s circumstances and challenges, and he used the metaphor of adjusting sails to reach a destination even though the direction of the wind cannot be changed. Jimmy Dean was also a proponent of giving back to the communities we come from. During his retirement, he demonstrated this in 2008 by donating $1 million to a university in his hometown. This was a powerful message, that no matter how much success we have achieved, we should remember our humble beginnings and give back whenever we can. He published his autobiography in 2004, titled 30 Years of Sausage, 50 Years of Ham, which contains many more inspirational quotes drawn from his life, and which continue to motivate more and more people. He is remembered as someone who overcame poverty, achieved success, and gave back to his community.